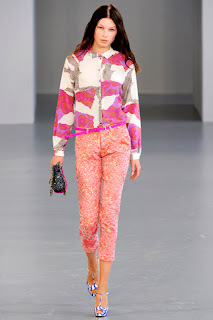 What has always drawn the fashion pack to Michael van der Ham is his striking use of colour and print combined with a faux naive approach which more established designers seem to have difficulty in retaining. 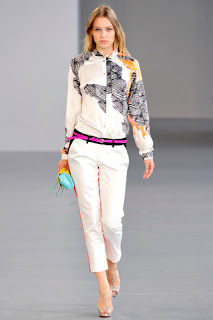 For S/S’12, his trademark pairings of vintage fabrics and patchwork prints with sheer chiffons, crepe de chines, open-weave cottons and textured silk satins added colour overload but what differed was his considered restraint in marrying these with very wearable ladylike lines in slip day dresses, crop capri pants, wrap skirts and layered shifts. Though it appeared at times disjointed, this was laboured as such and if criticism were to be levied it would be that less would have been decidedly more when working with such beautiful prints. Van der Ham was inspired by Joseph Szabo’s photography and the ‘more grungy, laid-back woman’ this conjured. However, it will undoubtably be the non-grunge, luxe-loving, cash rich customer of Matches, Liberty, Harrods and Harvey Nichols who opt for Van der Ham to make a statement about their fashion prowess. Like a modern day bon viveur meets Bloomsbury set, Van der Ham’s appeal is his nicheness as well as his niceness. And that’s not such a bad place to be. Catwalk pics kindly supplied by www.style.com. 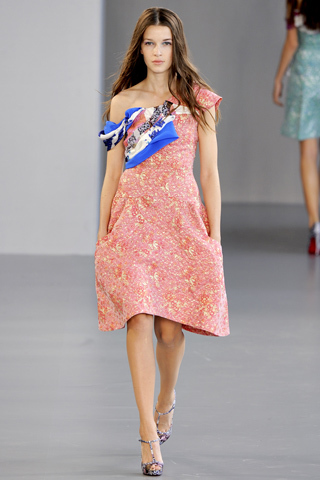 To see further images of the catwalk collections please click on the link.